FacilitiesNet recently published a helpful article on different dangers and safety concerns that all aerial lift operators and aerial work platform (AWP) workers should be aware of. Often times, the person or people in charge of purchasing an aerial lift don’t account for on-the-job dangers, such as electrical lines, fall hazards and everyday obstacles. One of the biggest potential hazards is Mother Nature. From fierce winds to rain, sleet, and snow, weather challenges are an aerial lift operator’s worst nightmare. Keep an eye on the weather reports prior to starting a job. If there’s any doubt about wind speeds or any other dangers, postpone the job for another day! The fast-changing aerial lift industry means that managers can’t assume today’s challenges can be handled by yesteryear’s equipment. Specifications are commonly ignored. CertifyMeOnline.net, the leader in online AWP, aerial lift, and scissor lift training, features up-to-date training modules that reflect updates to standards, safety guidelines, and other industry benchmarks. To cite just one example, the American National Standards Institute (ANSI) made changes to standard A92, which impacts everything from training to day-to-day operations. What are the day-to-day tasks involved in a particular job? 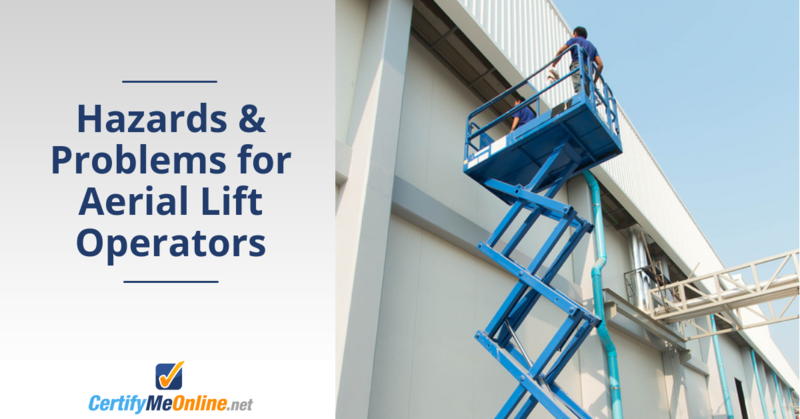 This simple question can help you or your company buy or rent the ideal lift. For example, if you work for a landscaping company, which types of tools are usually required for tree trimming? The same things goes for other work – electricians, maintenance personnel, and more. Review the different tasks associated with your supervisor and safety consultants to ensure proper job usage hazards are accounted for. You’d think this would be accounted for, but managers, supervisors and procurement departments sometimes don’t know the minimum and maximum reach of their AWPs, let alone if that range is applicable to their industrial needs. It’s important to know your aerial lift’s height requirements prior to use. Always consult the operating manual in order to double-check your lift’s capabilities. Nothing is more frustrating than preparing for a job, getting up into the air, and realizing that your aerial lift isn’t tall enough (or flexible enough) to handle the task at hand. Simply put, an aerial lift operator with little or no training is an accident waiting to happen. The best way to prevent costly aerial lift incidents is to hire or train qualified AWP workers. All U.S. employers are required by OSHA to train their employees. This presents many problems, from budget to scheduling and more. Thankfully, CertifyMeOnline.net has a great selection of aerial lift and scissor lift courses to help get you OSHA compliant in no time! More on that last point…proper training is vitally important for safe, efficient AWP operation. The more you know, the better you’re prepared to handle those tough on-the-job situations. And with fines and penalties reaching upwards of $20,000, there is a smart financial incentive (for your company) to ensure thorough training as well. With CertifyMeOnline.net, all of your training needs are accounted for. Our OSHA-aware modules and superior instruction cover all the bases. Along with AWP training, we also offer courses for boom lifts, fall protection, scissor lifts and much more. To sign up and get started today, contact the CertifyMeOnline.net customer service team at (602) 277-0615. You can also visit our contact page for more information, or click here to view our pricing and course catalog. From power lines to bad weather, there are plenty of aerial lift hazards. Which ones make up the top 5? Our team here at CertifyMeOnline.net looked at some of the most common dangers, and came up with a handful of hazards every aerial lift operator should be aware of. This popular blog looks at some frequent dangers, along with different techniques to limit your danger on the job. Falls from heights, electrocutions, tip-overs and more – read about the top 5 aerial lift hazards and be prepared in case of an emergency! This entry was posted in Aerial Lift Training on February 10, 2015 by admin.